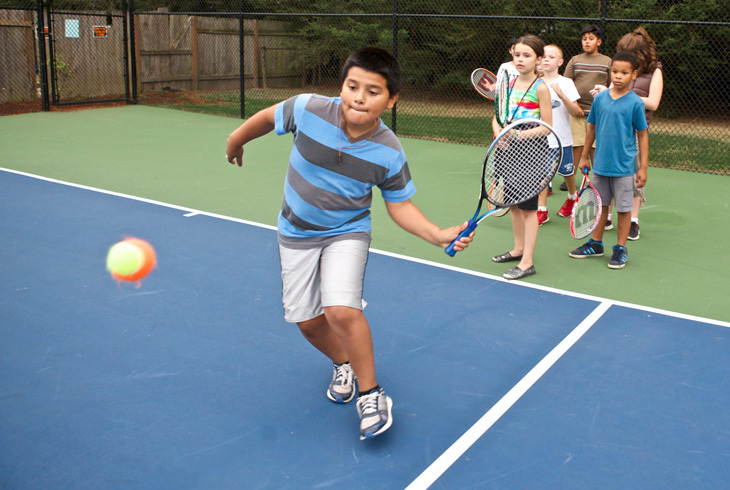 A new 60-foot tennis court at Barsotti Park is one way the district supports USTA's efforts to recruit young players. Junior Team Tennis, for players 9 to 18 years old, provides an avenue for players to compete against other club teams across the greater Portland area. Team matches consist of boys' singles, girls' singles, boys' doubles, girls' doubles and mixed doubles matches. Eight-game pro sets are played. The team score is determined by the total number of games won, not individual matches. Every game counts! Juniors may play on teams in one of six leagues and skill appropiate division. Players should have completed at least a minimum of Level 2.5 and be able to serve and keep score unassisted. Junior team tennis is offered every season of the year; not every division is offered every season. For more information, please contact Melissa Mayer (mmayer@thprd.org) at the Tualatin Hills Tennis Center. THPRD is partnering with the USTA to run a Junior Team Tennis division for kids 10 years old and under. This division plays with compression balls on a smaller court. More detailed information can be found here.